A frequent observation about the types of listening tracks found in regular English language coursebooks is that they appear stilted, unnatural and ‘pre-packaged’. 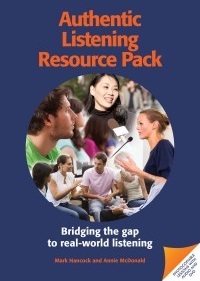 Authentic Listening Resource Pack is an attempt to prepare learners for the kind of ‘real’ listening that they will have to do in the world outside the classroom. It presents authentic tracks and video clips from a variety of sources ‘warts and all’ so that learners are given exposure to hesitations, repetitions and false starts, all of these being features of everyday discourse. The pack consists of a collection of 45 free-standing photocopiable listening/video lessons, designed to last about an hour. Subject matter is varied and divided into three main areas: informal conversational topics (like complaining), more serious conversation and discussion topics (studying abroad) and popular science/ academic topics (technology and rainforests). Level-wise, the material is pitched at B1 and B2 which equates approximately to PET and FCE, or on IELTS bands, somewhere between 4 and 6.5. There are also nine dedicated pronunciation lessons, which, in the main, use language from preceding lessons and focus primarily on prosodic features and accent variation. All of the ‘topic’ lessons follow a similar pattern and layout. Activities are divided into pre-listening, whilelistening and post-listening, and provide the learner with the scaffolding and support necessary to make the leap from regular textbook recordings to authentic material. The audio recordings for each unit are three to six minutes long and give learners practice in a wide variety of genres in addition to broadening their accent repertoire. Full audioscripts of all the recordings are included, and there is a link to a website which gives the full version of all the radio interviews used in the pack. A final noteworthy element of this publication is a checklist which gives techniques learners can employ to improve their listening and become more confident. The units which I used with my students worked extremely well. Students found the topic areas of interest and the activities engaging and challenging. The step-by-step approach to the authentic recordings definitely helped them make sense of what might otherwise appear as slightly overwhelming material. Also, an effort is made to integrate other language skills and the topic areas lend themselves easily to follow-up writing tasks or mini-project work. I found the lesson lead-ins particularly valuable in that they are varied and genuinely engage the learners from the outset. One point that I would make is that some indication of the approximate level of each lesson might be helpful. The units are arranged so that lowerlevel material tends to be at the beginning of the book, but the level of each unit probably needs to be made more explicit. I also found that the sections right at the end of a unit – where learners are asked to decide which activities helped them understand the best – did not work particularly well. My students found it difficult to answer these and to pinpoint specific areas, perhaps because of the metalanguage used. Overall, though, this is a really worthwhile buy which exposes learners to authentic material in a context which is both supportive and stimulating. Rory O’Kane is a lecturer at the Petroleum Institute in Abu Dhabi.